(AP) PUERTO VALLARTA, Mexico - Driving rain pelted Mexico's Pacific coast early Saturday as a weakened Tropical Storm Bud moved by a string of laid-back beach resorts and small mountain villages south of Puerto Vallarta. Emergency officials were on high alert for flooding and mudslides despite the storm's decreasing speed and power. The U.S. National Hurricane Center in Miami said Saturday that Bud is weakening and becoming increasingly disorganized in the Pacific just off Mexico. The storm has degenerated to a remnant low. It was expected to dissipate within the next day or so. Maximum sustained winds had weakened significantly and were near 30 mph as the storm hovered about 15 miles off the coast of Cabo Corrientes, Mexico. Forecasters say the storm could still drop another inch or two of rain along Mexico's southwestern coast. All tropical storm warnings and watches have now been discontinued. Heavy rain started Friday night in Puerto Vallarta and rainfall was expected to accumulate from 6 to 10 inches in many spots. Mexican authorities canceled school in 11 communities expected to be hit by heavy rains in Jalisco state. Emergency workers prepared emergency shelters, many of them in empty school classrooms. The state was placed on high alert as the storm center neared land, and emergency officials in Puerto Vallarta said they were closely monitoring villages that had been hit by flooding and mudslides in previous hurricanes and tropical storms. But on Friday night the sea along the city's famous beachfront appeared calm. Swimming was temporarily banned as a precaution. Rains and 6-foot high waves pelted Melaque, a beach town on the Bahia de Navidad, about 60 mph east of the sparsely populated stretch of coast where the storm's center was expected to come ashore during the night. Category 2 Hurricane Jova hit the area in October, killing six people and flooding parts of Melaque and neighboring Barra de Navidad. "There was a lot of flooding in the whole area, and we lost electricity," recalled Rafael Galvez, manager of the Hotel Bahia in Melaque. But this week, he said, only seven of his hotel's 26 rooms were occupied, and none of the hotel's guests were planning to leave. Streets in some coastal towns were filled with water. 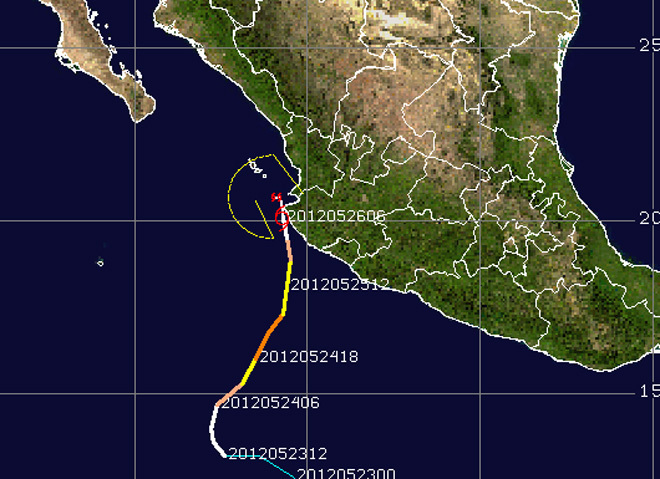 The hurricane center said the storm could brush land then make a U-turn and head back out into the Pacific. Rain, rather than wind, could be the big threat, with the center warning of the "potential for life-threatening mudslides" in steep terrain inland. The government of Jalisco state prepared hundreds of cots and dozens of heavy vehicles such as bulldozers that could be needed to move debris. A separate storm was pounding much of Cuba and the Bahamas on Friday. Cuba's civil defense agency reported that a French citizen, Alain Manaud, and Silvestre Fortun Alvarez of Cuba were missing after trying to cross rain-swollen rivers, according to the government's Prensa Latina news agency. It said a search for them was continuing. An official at the French Embassy in Havana said Manaud was 66 and had lived in Cuba for several years. He spoke on condition of anonymity because he was not authorized to comment publicly. The agency quoted government meteorologists as saying more than 20 inches of rain had fallen on parts of the central province of Sancti Spiritus. The hurricane center reported that the system had about a 70 percent chance of becoming a tropical or subtropical cyclone. Off the Atlantic coast of the U.S., there were tropical storm warnings for the Southeast coast from northeastern Florida to South Carolina as a cluster of thunderstorms gathered strength and was expected to become Tropical Storm Beryl over the Memorial Day weekend.